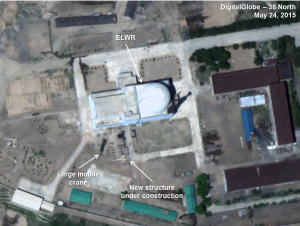 Recent commercial satellite imagery indicates new construction activity at the still incomplete experimental light water reactor (ELWR). While the structure itself has appeared to be externally finished for some time, the facility is not yet operational. 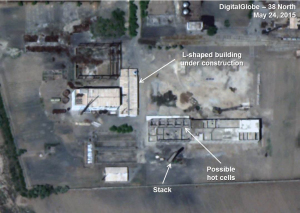 Construction activity observed on satellite imagery from May 24, 2015 indicates that electrical equipment is probably being installed and a building constructed using a large mobile crane. The structure appears intended to support transformers and power distribution equipment for the production of electric power, the stated purpose of the ELWR (figure 1). Once this construction project is complete, power lines can be extended into the transformer yard/building allowing the North to begin reactor operations when ready. It remains unclear, however, whether any other additional work needs to be completed before the North can start reactor operations. Figure 1. Construction activity at the ELWR. The construction project is on the river side of the primary ELWR structure where a power line that is also serving the 5 MWe Reactor has been operational for some time. Imagery shows lines on two-legged poles strung differently than in the United States. While the primary poles used at Yongbyon are two-legged, when there is a split in the service, a four-legged square structure is used to support the division. Such a structure supports service to the 5 MWe Reactor, and three additional two-legged poles extend the line down to the ELWR area where the service appears to end at a three-pole triangular structure that is apparently used to turn the service into that area (figure 2). Figure 2. Power line service to 5 MWe Reactor area. 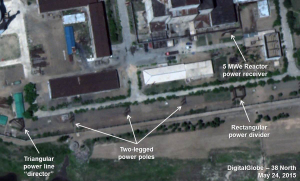 Imagery from May 24 indicates that the 5 MWe Reactor was either operating at low power or not at all. The reactor seems to have been operating irregularly since fall 2014 although the exact nature of the problems facing Pyongyang remain unclear. On May 24, there were no indications of steam or hot water discharge that show whether the reactor is in full operation. There are several vehicles in the reactor area, including what appears to be a long-bed transport truck. Vehicles have been present in this area each time the facility has been photographed over the past several months but their purpose remains unclear (figure 3). Figure 3. 5 MWe Reactor on May 24—vehicles present, no indications of steam or water discharge. 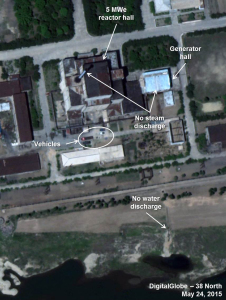 Recent imagery indicates continued progress in the construction at a complex probably part of the Yongbyon Uranium Enrichment Facility. The purpose of this specific project, begun earlier in the last decade then abandoned by 2010 and reactivated in 2015, has been unclear, although it may be related to reactor fuel construction. Construction of the new building next to the stack has progressed to the point where the walls for the ground floor spaces are mostly erect. Of these visible spaces, five adjoining thick-walled rooms are located at one end of the structure. While it may be too early to positively identify their purpose, their configuration suggests that they are hot cells that would be used for the remote handling of radioactive nuclear material for either civilian or military purposes (figure 4). The remaining buildings under construction in the complex provide no additional clues. An L-shaped structure is nearly complete, and two other buildings are in the early stages of construction. Figure 4. Continued construction at the uranium enrichment facility. William Mugford is a former all source analyst with 50 years of experience in satellite imagery analysis, spanning from the US Navy to Sandia National Laboratory. His expertise is on nuclear facilities, including those in Russia, Eastern Europe and China. Although two-legged power poles are not unknown in the US, the US primarily uses single pole distribution systems. The larger the amount of electrical power carried on the lines, the larger the poles or towers.